Attention: anyone teaching general music, either in upper elementary/primary school or junior high school. 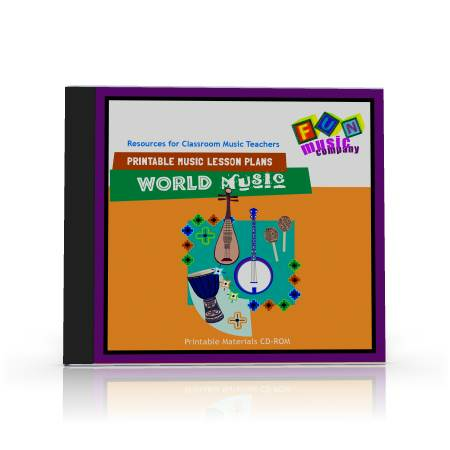 Get 14 Prepared lessons on the subject of World Music and save yourself hundreds of hours lesson preparation time! Here is one topic that is incredibly interesting and very engaging to students in schools, yet isn’t taught very much. The reason? I think its because it is quite simply too much work to prepare. That there is a group of musicians in Africa who have been playing together for 1,000 years? That there is a country that hosts a parade every year that attracts performance groups numbering in their thousands… with three hundred drummers in each group! Which country influenced the modern symphony orchestra by introducing the cymbals, bass drum and bells during the classical and romantic period? Which country the guitar came from?, and what cultures it has the most influence on? That there is a wind instrument that is made of wood and is six meters long, used in one part of Europe. What a gift we will be able to give to our students, if we can share with them this amazing music from other cultures besides our own. It would be a great tragedy if our students were only exposed to one form of music, however, that is what sadly happens in a lot of schools. I’m not saying that we need to abandon teaching popular music style in favor of teaching about unusual cultures, however what I am saying is that somewhere in a general music students music education, exposing them to world music is extremely important. As with all our “Printable Music Lesson Plan” modules you can pick and choose what you want to teach, and use them whenever you need. One terms work on World Music and you’ll share a wondrous world of music with your students. No: they won’t suddenly want to pick up a sitar and spend ten hours a day in deep study of Raga’s – However they will know what a sitar IS, and that’s a gift that you have given them for life! The Development of this Module…. Before I go on, I have to share with you some of our process in developing this unit of work, because it was somewhat different to our previous modules. In the past we have found a team of wonderful writers, and we have instructed them to go out and research topics to bring together a fact sheet, lesson planning ideas and a fun style worksheet. For this one we decided to do something different. We used our mailing list and other methods and tried to find an expert from each country that we wanted to write a lesson on. We couldn’t find an expert from every country, but we did come close! We found some wonderful writers from India, Indonesia, Brazil, Turkey, Spain and Europe, and we brought them all together with some of our best writers to come up with the drafts. We then had experienced educators edit the lessons, and we refined the topics somewhat, because some of the lessons were a little too broad and we felt would be better if they focussed on one specific area. For example, we had a lesson on Indonesian music, and the topic was so broad (given that there is 17, 508 islands in Indonesia, and who-knows how many musical styles! ), so we refined the lesson down to talk about Indonesian Gamelan. We wanted to keep the topics specific and interesting to students in schools, while still providing an overview of world music in as concise a manner as possible. Africa is such a huge continent, with hundreds of different languages and cultures. This lesson just touches on the huge amount of music learned in Africa. Students will discuss colonialism in Africa, the trading of African slaves and the impact that this has had on the musical development of the rest of the World. The Gamelan orchestra’s of Java and Bali are one of the most fascinating world music styles that one can be exposed to. Students will learn about all the different Gamelan instruments, and explore scales that give the music such a unique sound. There is even opportunity for students to play their own percussion instruments in Gamelan scales! How many Westerners know the names of traditional Chinese musical instruments? I certainly didn’t know anything about an Erhu, a Guquin or a Pipa until I started preparing these lessons! In this lesson students will also learn a little about China’s political history, and the impact that this has had on the development of popular music styles. Traditional Indian music, using the sitar, tabla and other instruments has basically not changed for hundreds of years. With this amount of culture and background behind it students will discover what it would take to become a master on one of these instruments, and the influence that it has had on Western popular music. In this lesson students will learn about the foot tapping, hand clapping infectious rhythm of Irish jigs that is so popular in many countries today. This lesson was going to be about “middle eastern music”, but with that topic so broad, and an opportunity to get a lesson written by an expert in Turkish musical styles we decided to just make it about Turkey – a country that geographically is like a “bridge” between the east and the west, and really is like that with its music as well. This is one of the biggest lessons in the module, and could even be spread over a couple of weeks, it covers so much material. Students will learn about the different regions of Europe, and the different instruments and musical styles that are prevalent in each region. What world music subject would be complete without talking about the birthplace of the guitar, Spain. The students will discover the important musical styles of Spain, including Flamenco and Tango, and how they have influenced other countries and styles. Once again we started with the idea of “West Indian music”, and found the subject way too broad given the differences and range of influences around the Caribbean islands. for this reason we discuss just one style found in the Caribbean – Calypso, and discover one of the most interesting instruments developed in the last hundred years – the steel drum. Possibly one of the most important lessons of this module, as it gives some of the background of many of the Latin American dance styles that are so popular today. Students will discover the background of the Conga and Bongo drums, and learn to play the clave – the five note pattern which is the basis of many styles. This lesson focusses on the samba style of Brazil, and particularly the street samba performed in the yearly Carnival. This is truly of the most biggest and most interesting festivals held in the world, and being able to expose students to the music featured in it is a brilliant opportunity. Mexico in central America has a very interesting musical tradition. It’s much more than three mariachi guys standing there in big hats playing the guitar! Students will discover the different musical styles that make up Mariachi, and the instruments used in them. with key points bolded in a special font. Everything students need to know is there, and we’ve trimmed it down to the most relevant facts. OR… You can have a “fill in the blanks” factsheet where students will have to fill in key points during the lesson. This is aligned perfectly with the included powerpoint presentations which are demonstrated below. This module contains everything needed for fourteen enjoyable lessons on the history of jazz and blues, through studying these amazing jazz musicians. You’ll know all the answers here with the answers to every single crossword and puzzle in the unit. Students should be able to be self directed in their learning with the worksheets, and these answer pages will certainly help the teacher! We have prepared Powerpoint slides ready for you to load into your data projector or use with your digital whiteboard. The presentations work hand-in-hand with the “fill in the blanks” factsheets so that students can run through the material with the teacher in the class, and fill in the important key information on their fact sheet at the same time. In the members area website we have a special resources area, with links to purchase recommended albums and songs from itunes, and links to freely available content on Youtube. If you’re teaching a unit on world music you may well need a completion assessment or final test or exam. You may even need formal assessments to fulfill the requirements of your school or education department authority. How much do I need to know about World Music? Hopefully – absolutely nothing! We’ve kept this as simple as possible, so that you can implement it with very little background knowledge or research. We’ve done all the hard work for you so that you can just have a quick read through and get ready to present the material to your students. What age level is this material suitable for? You can use this material in upper elementary school or in junior high school. Our lesson plan ideas have “ideas for younger students” and “ideas for older students included. No – this product includes printable materials and powerpoint presentations only. If we had to seek out the copyright permission to distribute recordings of each one of the artists involved the product would probably cost ten times the amount it does now. What we can do is provide links to freely available recordings on YouTube, and links to purchase individual tracks from iTunes from as little as 99c per track. There is more than enough material in each lesson to complete a 45 minute – 1 hour lesson, and you could even stretch it out over a couple of lessons if you wish. print out just what you need for each lesson in advance, or if you wish you can print out the entire student workbook included and bind it for them at the beginning of the course. Is all this material completely accurate and culturally ‘sensitive’? We have made a huge effort with this module to have the lessons written by or at least viewed by someone from the country/region that the subject is on. Because the scope of the topic is so wide we know that there may be different opinions on what should or shouldn’t be included. We do take all revision requests seriously, so if you find any errors or ommissions at any time please do contact us and if necessary we’ll update the materials. Printable Music Lesson Plans Modules are $39.95 per module. This includes all 14 lessons, all the printable bonuses and powerpoint presentations. You can print out as much as you need for your teaching. The only restriction is that you cannot re-sell or share the license with anyone else. What if I find that I can’t use it? If your students don’t like it, or you find for any reason that you can’t use these materials just contact us for a no-questions-asked refund. Lesson One What is World Music?